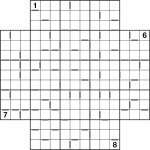 Continuing with Two-away puzzles, I thought today I’d post a somewhat smaller challenge – an 8×8 Jigsaw Sudoku version. 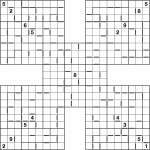 Here’s a puzzle for the weekend – it’s a 5-grid samurai sudoku where in the corner grids a couple of the 3×3 regions have had their outlines tweaked to turn them into jigsaw sudoku puzzles, with full 8-way symmetry. There are very few givens, which means you’ll need to take full advantage of the two-away markers that are also in the grid. The grey rectangles indicate all neighbouring squares where the difference is 2 (e.g. 1&3 or 6&8) – even without precise values they can also be useful for quickly indicating where a chain of squares are all odd or all even. I made this puzzle yesterday but then went and forgot to post it (oops) so I’m making up for that now! It’s a Samurai Star with two-away markers, just as per the previous two puzzles I posted. 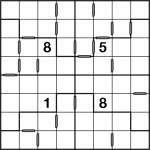 Place 1 to 9 into each of the rows, columns and 3×3 boxes of the 5 underlying Sudoku grids (including the one in the centre), whilst obeying the two-away grey bars. Squares with a grey bar between have a difference of 2 (e.g. 1&3 or 2&4), and those without a grey bar have a difference which is not 2. There are only 4 givens to get you going, so good luck! I thought that yesterday’s puzzle wasn’t the best example of a new variant, so here’s an easier Two-away Sudoku puzzle. 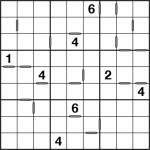 It has a few more connected squares which means the odd/even nature of the puzzle comes through a bit more clearly – if you’re familiar with consecutive sudoku then it probably won’t take you very long to solve. The rules are as yesterday: place 1 to 9 into each row, column and 3×3 box, and then wherever a grey bar separates two squares the difference must be 2 – they must be “two-away” – and conversely where there is no grey bar then the difference is not 2. I just noticed that Monday marked my 50th post to garethmoore.co.uk, so to celebrate I thought I’d try a (slightly) new variation today: Two-away Sudoku. 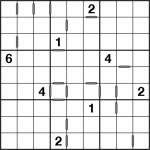 As its appearance might suggest, it is a close relative of Consecutive Sudoku. In fact it’s pretty much the same, except that the shaded grey bars indicate that the difference between neighbouring squares is 2 (not 1, as in Consecutive Sudoku). As in Consecutive Sudoku, all grey bars are drawn – so if one is absent then the difference is not 2. For example, if you see a grey bar next to a square with ‘1′ in it then the neighbouring square must be ‘3′. However if you have a square with ‘1′ in and there is no grey bar between it and a neighbouring square then that square cannot contain ‘3′. It’s pretty simple really. So – just place 1 to 9 into each row, column and 3×3 box whilst obeying the grey two-away markers!